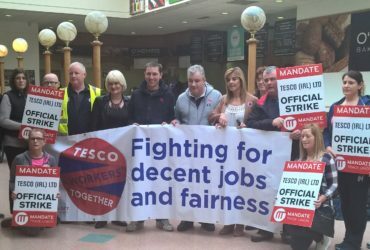 For the past 3 years Mandate members, particularly those employed in Dunnes Stores, have been highlighting the plight of low hour contract workers and insecure work. In recent months, their activities have intensified with local lobbying meetings taking place all across the country where members called on politicians of all hues to support the Secure Hours = Better Future charter. The charter sets out the minimum terms necessary from any Bill enacted by the Oireachtas to ensure workers have secure hours and secure incomes. 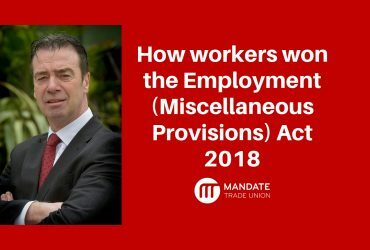 At a Select Oireachtas Committee Hearing on Thursday, 17th May 2018, a number of key amendments to the proposed Government ‘Employment (Miscellaneous Provisions) Bill 2017’ were voted on and adopted. In total, there were 50 amendments proposed by the Government, Willie O’Dea (Fianna Fail), John Brady & David Cullinane (Sinn Fein), Willie Penrose (Labour Party), Roisin Shortall (Social Democrats) and Joan Collins & Clare Daly (Independents4Change). Effectively, Mandate members had all of their key demands adopted. The first major success on the day was in relation to the lookback period. This is the period within which an employee on a low hour contract (for instance 10 hours), but working in excess of their contractual hours (for instance 30), may seek a review of their hours and is then issued with a new contract that accurately reflects the hours they actually work. The government had proposed an 18 month lookback period. Mandate members had been seeking a maximum lookback period of 12 months. After some debate, it was agreed that 12 months should be the lookback period. 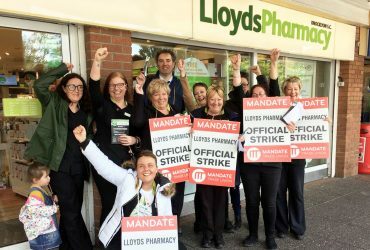 Mandate had pointed out that the above bands left too much flexibility for workers hours at the discretion of their employer. For instance, band B facilitates a total reduction in hours of almost 50 percent – which would constitute a corresponding reduction in income of 50 percent. Band C facilitates a reduction in hours and therefore income of 33 percent. And as we know from our survey of members in Dunnes Stores, unscrupulous employers use flexibility around hours and income to control and discipline staff (85% of Dunnes workers say allocation of hours is used as a control mechanism). As you can see, the above bands are much tighter and provide for much more security of income for workers. The next amendment reinforces and strengthens the above provisions. This key provision has the capacity to transform working life for tens of thousands of workers who want more hours at work but cannot access them. These people are often referred to as “underemployed” or “involuntary part-time workers”, and according to recent figures, Ireland has the second highest rate of underemployment in the EU15 behind Spain. Today’s Select Oireachtas Committee hearing was a massive success in the campaign for decent work in Ireland. There is no doubt that the efforts by Mandate members all across the country in recent months was the key reason these amendments were adopted. However, Mandate would like to offer a special thank you to the TD’s and Senators in Dail Eireann who have pushed this issue relentlessly in recent years including David Cullinane TD, John Brady TD, Clare Daly TD, Joan Collins TD, Brid Smith TD and Senator Ged Nash. We would also like to thank all the TD’s who supported todays amendments and those who have signed up to the Secure Hours = Better Future Charter. 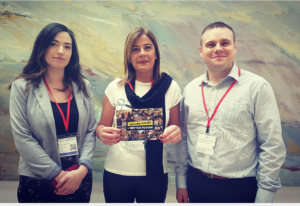 Last but not least, we want to thank all of our members who lobbied TD’s in recent months, all the Dunnes Stores members of Mandate who took industrial action to highlight this issue in 2015, and the delegation of Mandate members who attended todays hearing. The Bill will move on to the report stage in the Dail, which the Minister promised would take place in the coming weeks and we are hoping that the legislation will be passed and enacted into law before the summer recess of the Oireachtas. Mandate will keep all members informed of developments as they occur.